This past weekend was an unusual one for the folks with John Force Racing, with the patriarch of the team being involved in a scary crash in his Chevrolet funny car while daughter Courtney drove her Camaro to her first event win of the season – beating the Dodge Charger of Tommy Johnson Jr. This past weekend, the teams of the NHRA funny car big leagues descended upon Wild Horse Pass Motorsports Park in Arizona for the second event of the 2018 season. Courtney Force drove her John Force Racing Camaro to the event win, beating the Don Schumacher Racing Dodge Charger of Tommy Johnson Jr. Normally, this piece would focus on Camaro funny car win #1 for the 2018 racing season, but unfortunately, the more important news is John Force’s big crash. In the second round of eliminations this past weekend, John Force and his Chevrolet Camaro were taking on Jonnie Lindberg in his Toyota Camry. After Lindberg shook the tires early in the run, Force had an easy drive to the win, but just as the Camaro crossed the finish line, it exploded. The lightweight body disintegrated and as the remaining vehicle was engulfed in a ball of flames, it shot across the track, hitting the wall in the other lane. As it bounced off of the wall, Lindberg’s Toyota hit it, driving under Force’s car. As the Camry went by, what was left of the Camaro got caught in the parachute chords of the Toyota, pulling Force’s car into the back of Lindberg at speed. That caused the Toyota to nose out and hit the wall, at which point the body of that car popped up into the air. The wrecked ended as both cars coasted across the track at speed and hit the other wall, hard enough to hop Force’s car up into the air. The emergency crew was on the scene as soon as the two race cars came to rest. Lindberg climbed out of his car right away, Force did not. The video ended before he was out of the car, but the announcers were quick to announce that the 68-year old legend of the sport was awake and communicating when he was taken to the hospital. Last night, it was announced that he was released from the hospital with a clean bill of health. You can watch the crash in the video below. 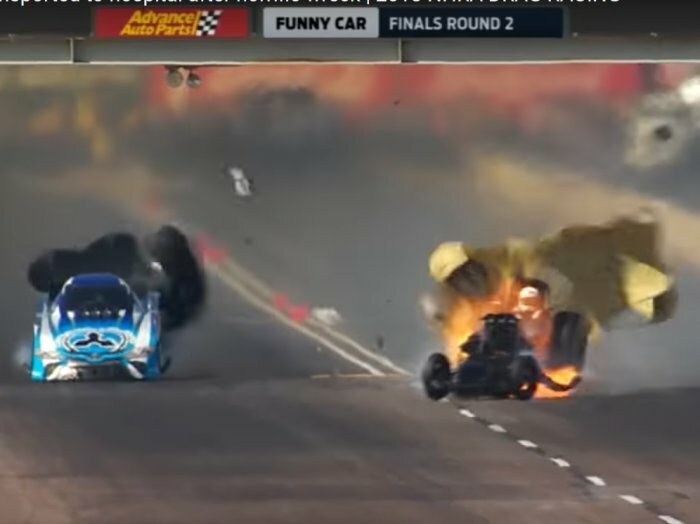 The NHRA Arizona Nationals started off as another great battle between John Force Racing and Don Schumacher Racing. Courtney Force and her Camaro took the top spot in qualifying, followed by Dodge Charger drivers Ron Capps and Jack Beckman in second and third while John Force put his Camaro in the fourth spot to start the elimination rounds. In the first round, Courtney Force beat Del Worsham, John Force beat Jeff Diehl, Ron Capps beat Tim Wilkerson, Jack Beckman lost to Richard Townsend, Matt Hagan beat JR Todd and Tommy Johnson Jr beat Robert Hight. This created a second round matchup between the Camaro of Courtney Force and the Charger of Matt Hagan – the winner of the first event of the season. Courtney beat Hagan when the Charger ran into issues, but the biggest race of the second round came between John Force and Jonnie Lindberg. That, of course, was the race that resulted in the nasty crash in the video below. John would have run Courtney in the third round, but after the crash, she had a single-run into the finals. On the other half of the bracket, Ron Capps lost to Shawn Langdon, before Tommy Johnson Jr beat Langdon to advance to the finals. In the finals, Courtney Force slept at the line with a .104 reaction time, giving Johnson the early lead with his .052. However, the Charger run into issues while Force laid down a blistering 3.834 at 337 miles per hour.